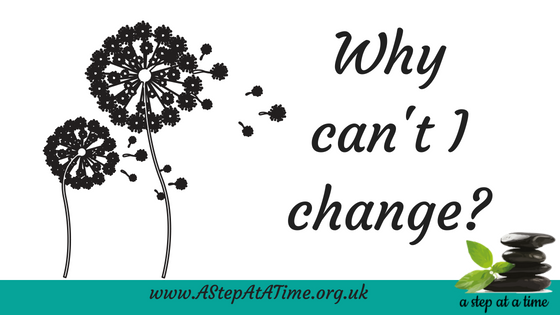 So often I meet people in every day life who talk to me about the fact that they ‘can’t change’ or that they ‘are just this way’ – even though their feelings, actions, behaviours or lifestyle are causing them upset they cannot find a way to change and feel that ‘nothing works’. However, whilst they will talk about it they find that the action to move out of it is not forth coming. So what is the difference between those who take action and CHANGE and those who think about it but cannot take action? 1.Is the change that you desire realistic and achievable? Give consideration to whether the change you would like to make is achievable and realistic. If the answer to either of these is ‘no’ then you goal will need review. If it is unrealistic because you do not have the expertise can you realistically afford to find the professional help you need? If the change is not achievable, then you need to review the change to create a situation where it is. 2. Is it your priority? Then it is highly likely that it is not your priority and will therefore not get the energy it requires. Consider your key priorities – family, job, friends, commitments, children, house etc – does your goal come in the top THREE? For a change to be instigated and maintained it needs to be in your top three priorities. Consider an individual who is caring for a friend/family member, working long hours and repaying debt… they would like to exercise more – but each day the first three factors are their priority – if there is overtime at work they will choose this over a gym trip – if there is a call from a family member for help – they will choose this over a fitness class – if they have an opportunity to make some additional money – they will choose this over a food shop – their priorities are high demand and focus and therefore their desired change is not a priority. Now consider that the friend/family member is better or there is extra help available – now their priorities can include themselves and allow them to exercise more, increase their fitness and feel better. Be honest – In order to achieve any change you need to look at your priorities and look at where it sits – list all your commitments on a sheet of paper and number them 1-10 in priority order. Now look at where your change sits within that list – if it is number 1-3 then get moving – if it is 4-10 what can be changed about 1-1 to let you get changing? Re-evaluate – Have you taken on other people’s responsibilities? Are you carrying any loads which are not yours? Are people expecting things you cannot offer? Are you overloaded? Are you taking on too much to please others? Can anything be moved? Can anyone help? Look at options to move the change into your top 3.